Hobie, Owner & President of Barrett Landscaping, is a Savannah native and a graduate of Savannah Christian Preparatory School. After high school, he attended Abraham Baldwin Agricultural College in Tifton where he graduated with a degree in turf management. While in college, Hobie completed internships with Kiawah Island in South Carolina and Turf Services Unlimited. Following college, he relocated to Orlando, FL where he started out in golf turf maintenance with Ginn Development. After a few years in Florida, Hobie relocated back home and took a job as the Golf Course Assistant Superintendent for Hampton Island Preserve. He then worked for a large landscape company. Given his experience in the landscaping industry, Hobie bought a used mower and started his own landscaping company in 2009. 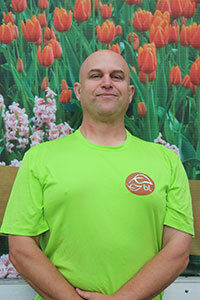 In 2012, he became a Georgia Certified Landscape Professional. Since the certification's introduction in 1993, only 300 individuals in the state of Georgia have earned it. Barrett Landscaping is the only Landscaping company in the Savannah area with a Georgia Certified Landscape Professional on staff. When not managing the full business operations of Barrett Landscaping, Hobie enjoys spending time on the water, traveling, and working on personal and professional development. 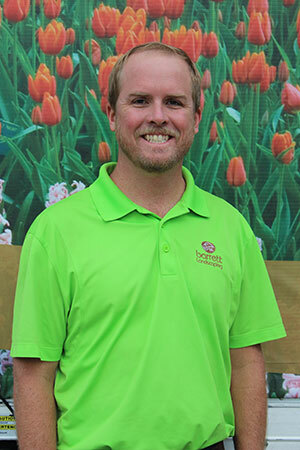 He attends several conferences each year to learn more about business management and to keep up-to-date on horticulture and landscaping industry trends. Hobie is a member of the Tybee Island Marine Rescue Squadron and the Savannah St. Patrick's Day Committee. Hobie, his wife Jennifer and their new baby live on Wilmington Island. Chuck was born here in Savannah at Hunter Army Airfield and grew up in Hollywood, Florida. 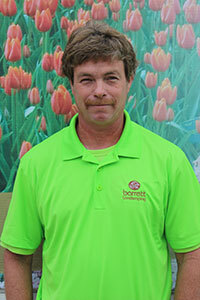 Starting our in landscaping in 1986, Chuck brings over 20 years of horticulture and landscaping experience to the team. When not leading the team at Barrett Landscaping, Chuck can be found playing disc golf, fishing, or cheering on the Miami Dolphins. Chuck and his spouse Donna have been together for over 26 years and were very proud to purchase their first home last year. Dominick has lived in the Savannah area for over seven years now and finds it very rewarding to care for the landscape of the homeowners in our community. What he enjoys most about working in horticulture and landscaping is seeing the joy on a homeowner's face when the job is complete. When Dominick is not leading a team at Barrett Landscaping, you can find him fishing, kayaking, hiking or camping. I think it's safe to say that Dominick enjoys being outdoors.